We respectfully lifted this information regarding Mike Lash from his website. Who could better tell us about himself? Definitely not self taught, from press he has received he is however, fringe-y, "... a professional artist with over 30 years exhibition experience with one-person exhibitions in the United States, France, Switzerland, Yugoslavia, Hong Kong and Japan. He received his MA in painting from Northern Illinois University in DeKalb, Illinois, where he later was honored by being awarded the outstanding College Alumni in 2001 for the College of Visual & Performing Arts. Some of the major public collections that include his work are: The Museum of Contemporary Art, Chicago, IL; Centre d’Art Contemporain Geneva, Switzerland; Illinois State University Galleries, Bloomington, IL; National Museum of Contemporary Art, Belgrade, Yugoslavia; The Weisman Art Museum, University of Minnesota, Minneapolis, MN; National Museum of Art, Washington, DC. He is represented by Lyons Wier Gallery In New York, Gardenfresh in Chicago, and Gallerie du Jour in Paris, France." 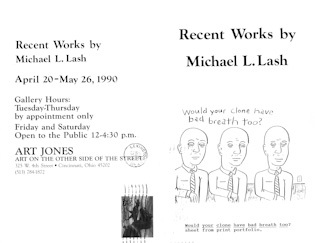 Art Jones presented a one person show "Recent Works by Michael Lash" in April of 1990. 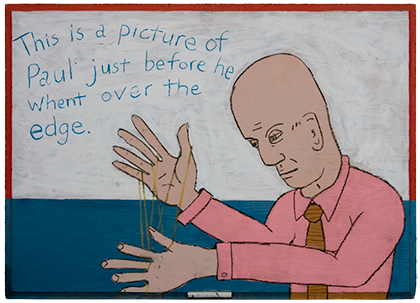 The work was consigned to Art by the Lurie Gallery in Chicago, Illinois. Art Jones seemed particularly pleased with the show siting the "intelligence and wit" the artist conveyed through his work. We purchased the piece painted in 1989 titled "I Really Knew Him" from Art Jones Gallery, Cincinnati, Ohio during that exhibit. Lash is represented by among others, Lyons Wier Gallery, in NYC. 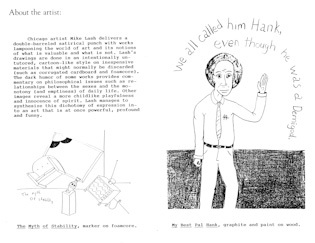 His work on their site continues to explore some of the same psycho-babble and style. We particularly like the pieces titled "Horse" and "Dragon" from 2009 and wonder now; are they still available? Exhibiting prolificly, a painting exhibition of Lash's work was held last year titled "Lies for Leo" at agnes b. 's Librarie Gallerie in Hong Kong. Lash is part of a group show presented by Broadway Suites at 192 Lexington Avenue, NYC from May 27 - September 27, 2010 titled "Color, But No Apologies."